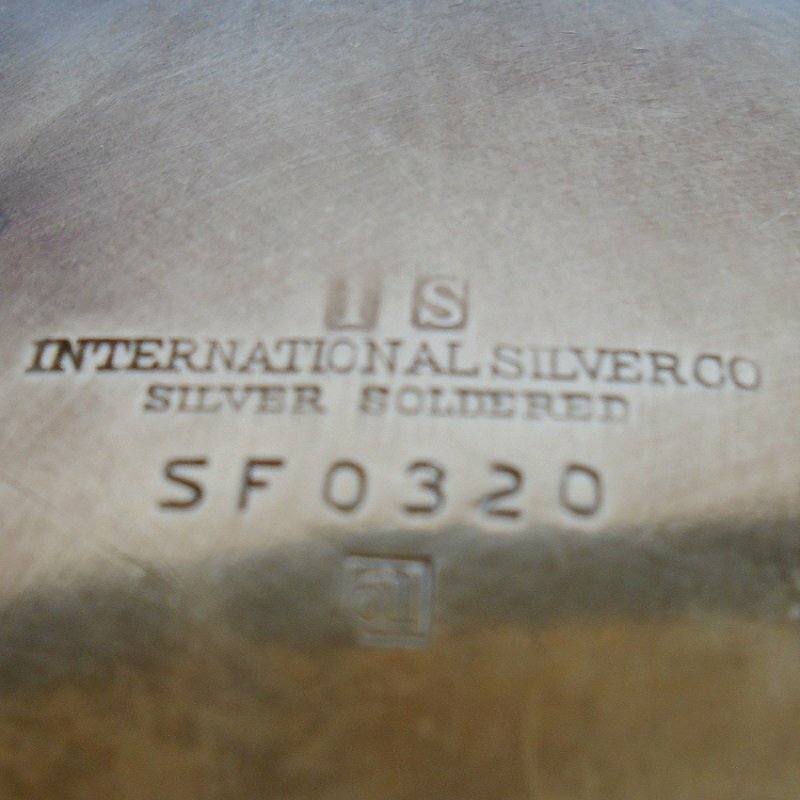 International Silver Co. vintage silver soldered ashtray with matchbook holder SF0320. Circa 1958. Great condition. Estate sale find. 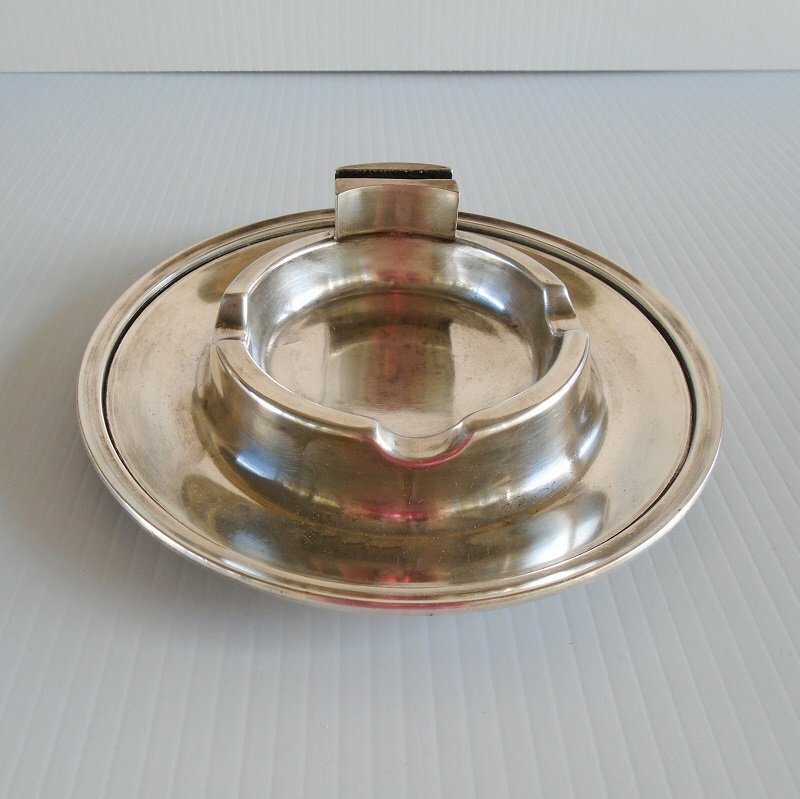 This International Silver Company ashtray is in excellent condition. There are some age appropriate very fine scratches, but as you can see from my photo, the scratches are hardly visible and are not deep. There are no dents or chipping. The ashtray measures 6.5 inches across. There is a raised area for holding a book of matches. As for the age, it is estimated at circa 1958. I purchased it at an estate sale and was told by the seller that it was a wedding gift to her parents. Buyer to pay USPS Priority Mail Package delivery charges of $10.95. Shipping is from Arizona. Every January the U.S. Postal Service increases the shipping prices. The January 2019 increase is beyond any we've seen in previous years. Before the 2019 increase, shipping costs were based on weight. A package weighing less than one pound cost the same amount regardless if it was mailed 2 miles away, or from coast to coast. Packages weighing over 1 pound were priced by what the destination zipcode was. Now, the postal service has divided the United States in to 8 zones and each package is charged by weight, size, and destination zone. Now it is not possible to state a shipping cost and have it be valid regardless if the package is traveling 2 miles or all the way to the east coast. I am in Arizona and probably 90% of the packages I mail out go to the east, and a majority of them go all the way to the east coast. To complicate this even further, Google will not show items for sale unless they have a designated cost, or unless the seller uses calculated shipping. My web host is not equipped to figure calculated shipping, so I have to quote a shipping charge using the east coast as the final destination and then refund over payments. When I return the overage, I do it by including cash inside the package when it's shipped. My feedback page will show verification that I do return overpayments. As a buyer, there are two choices. If you over pay on the shipping charges, I refund an appropriate amount to cover the over payment OR if you'd like to send me a message stating your zip code and the item you are interested in, I can quote you an exact shipping charge and send you a custom invoice with an accurate shipping charge. I do combine shipping on multiple items purchased, but as stated above, my web host is not set up to calculate multiple item shipping costs. At checkout, you will be charged full shipping price on each item purchased and I will refund the appropriate amount of over payment. If you are uncomfortable with that, send me a message with your zip code and stating which items you'll be purchasing and I'll calculate the correct combined shipping charges and send you a custom invoice.